Coach (now/ever): I have never had a formal coach but I’ve been helped along the way by the bulk of the Watsonville Handball Club, especially my father, Jim Peixoto, and friends, Jim Smith and Gary Maushardt. Moreover, without the support of my mother and father I would not be the player I am today. Sparring partner(s) at home: Currently, Erik Torres, Loren Collado, Dean Crispen and Eddie Bettencourt. Most important win in a tournament and most satisfying win in a tournament: Most important was my 3-Wall National Championship victory against Sean Lenning in 2006. My most satisfying is my 3-Wall National Championship victory against Dave Chapman in 2009. Best tournament ever won: 19 & under Junior National Championship in 2000. What do you do for work: Handball Coach at the Olympic Club in San Francisco. What are your goals in handball going forward: To win the singles at the 4-wall Nationals, the Race for Eight Championship, the Simple Green, the 3-Wall Nationals, and to be ranked #1 on the WPH Power Rankings. What are your goals for the R48 season: To win in New York, Denver, and Salt Lake City. Favorite handball tournament: The Watsonville 3-Wall Doubles. How do you prepare for Race events: I train intensely one to two times a day for 5-6 days a week in the month leading up to a tournament by playing handball (drills included) and completing workouts with my personal trainer, Rocky Snyder. I eat unbelievably large portions of healthy food and stretch incessantly. What do you love about handball: What I love about handball is that no matter who you are or how long you’ve been playing, handball always has a way of bringing out your true colors. It’s the perfect sport. How would you describe your game: When I am playing my best, I use my quickness for offense rather than defense. As one of the most athletic in the game, Emmett’s speed and endurance wins ball games. His natural ability to get any ball hit has put him atop the list of retrievers in the game. From 2005-2009, Peixoto was one of the most consistant players on tour (making the finals or semis in every appearance), before shoulder surgery in 2010 set him back. Back on tour again, Peixoto is lighting up crowds and is a fan favorite at every stop. 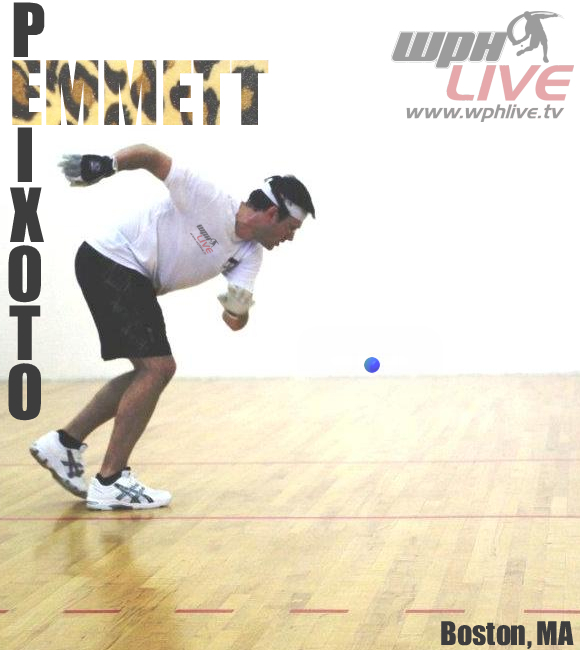 Emmett Peixoto has been one of the top players in the world since his teenage years. Peixoto turned 30 last year and continues to be a force on the pro handball scene. Along the way, Peixoto has earned a Master’s degree from Boston College and has released three albums! Peixoto recovered from right shoulder surgery in December of 2011, and he has rejoined the elite of the sport on the WPH Race 4 Eight Tour. Peixoto qualified for the Race 4 Eight Player’s Championship in Seattle May 3-4 for the first time with Race 4 Eight II wins over top eight stars Charly Shanks, David Fink, and Andy Nett. Enjoy the interview! WPH: You had right shoulder surgery in December of 2010, and it seems like you are finally returning to your best level after two years of strengthening and rehabbing. How difficult has this process been both physically and mentally? EP: Well, in short, the rehabilitation process extended far longer than I anticipated. When I returned to tournament play in April of 2011, I deemed myself ready to compete at a top level. However, I was a tad overanxious and my return was premature. My performance at the Boston Open (April 2011), the NYAC tournament (May 2011), and the USHA Nationals was one of steady decline. The buildup of scar tissue prevented my shoulder from enduring more than an half of a game—after which I would lose power, control, and most importantly, my confidence. Although increasing my shoulder endurance to the point at which it is now (about 90%) has been sluggishly long and physically taxing, the most difficult aspect of my recovery has been predominately mental. In fact, the mental struggle to overcome my fear to swing and regain confidence to authoritatively hit the ball has not only been onerous and unrelenting, but has been so profoundly forceful that it both hindered my restoration and exacerbated my somatic cohesion. Fear and lack of confidence led my body to unconsciously protect itself and overcompensate, thereby disallowing my hips to transfer my weight appropriately. Instead of a nice fluid swing I began to pop upward on my follow through in order to avoid swinging through the ball. Consequently, I began to develop hip problems due to this overcompensation. Physical complications amounted until I began a full-time regimen with a personal trainer. My personal trainer has enabled me to regain conviction in my body, enabling me to overcome my fears and lack of confidence. A full-time personal training regimen and relentless handball drills have been necessary for my rehabilitation. I am just now beginning to reach the level I have been striving for and I finally have faith I will reach my potential in the next few months. WPH: You are not only one of the elite handball players in the world, but you are also a burgeoning singer/songwriter. How do you balance these two diametrically opposite worlds? EP: The handball world and the music world are not as diametrically opposed as one would initially conclude. I agree that both worlds require many different abilities and thus a great amount of time has to be allocated to each. Accordingly, I do have to balance my time well in order to efficaciously carry out both arts. However, what I love most about the handball world and the music world are the similarities between them. Their artistry requires patience, faith in oneself (i.e., both one’s abilities and the products of one’s abilities), perseverance in the face of failure and negativity (especially one’s own negativity), the ability to perform well in front of an audience, continual practice and determination, awareness of variegated subtleties in one’s body and mind, receptivity to critique, revaluation, and education from others and oneself, starting anew when something isn’t quite working, creative moments where one must listen to what the art itself requires (rather than attempt to impose “thought” or “knowledge” on the moment), and most importantly, recognizing and attentively understanding one’s limitations, not so that one’s limitations can be overcome, but so that one can appreciate the radical potential inherent in them. Whether I am writing a song, performing at a show, competing at a handball tournament, or doing drills, I am never simply executing four separate actions but rather I am continuously striving to reach the same end. In this way, balance is not achieved by juggling my time between two separate arts, but rather by aspiring to the balance embedded within them. WPH: You are known as one of the greatest “get artists” and retrievers in today’s game. Your named has even become a verb. When a player makes an amazing retrieve we often hear players and fans say, “You Peixote’d that ball I thought was down!” Does that moniker inspire or upset you? EP: It thoroughly upsets me! Just kidding. I am honored that my abilities and talents have inspired a verb in my name, especially one highlighting my ability to retrieve seemingly nonreturnable shots. I love frustrating my opponents with my gets. However, my ability to retrieve difficult shots comes with a danger. At times in my handball career I have been stuck in an “Armijo” like game, that is, a game in which I get in the habit of solely being a retriever. I ultimately want to be known for something other than just one of the greatest “get artist,” I want to be known as one of the greatest players. WPH: You are a natural right-hander, but your left hand is so smooth and precise that most top players prefer to play your right even before you right shoulder surgery. How were you able to develop such a phenomenal off-hand? EP: I started playing handball when I was twelve years old and I was immediately hooked. However, shortly after I started playing I severely bruised my right hand. The bruise went straight through my hand and was so excruciatingly painful that for six months I couldn’t hit a ball with my right hand. During this period I played solely with my left hand. When the pain subsided and I began to use my right again my left had nearly became my dominant hand. Since that time, there had only been a slight difference between my right and left hand, that is, until my injury. My right is finally becoming dominant once more, but it has been a laborious journey. WPH: You returned to pro handball last year after a substantial absence from the tour. How difficult was it for you to start at the bottom after so many years as an elite player on the pro scene? EP: Initially, the most challenging difficulty I faced was adjusting to my inability to play like I knew I was capable. In all honesty, I nearly know what it feels like to be “past my prime”. To know that you can play much better than your body will allow is an exceedingly disheartening dilemma. However, watching my knowledge and my level of play finally reach an accord has been a remarkably rewarding experience. WPH: You have played this Race season with a lot of flare and enthusiasm. The fans love it, the webcast viewers tune in to see it, and your energy and passion seem to add so much intensity to your matches. Was adding excitement to the game a designed part of your resurrection as a top player, or are you just really excited to be out there competing? EP: I think that my recent demeanor on the court has manifested due to the reason just mentioned. The battle to achieve a firm grasp on my present capabilities has given me a wholehearted appreciation of being a professional athlete. My injury, rehabilitation, and return to the pro tour have all contributed to instill within me a powerful and far-reaching awareness that the time I have as a pro handball player is inordinately transient, contingent, and delicate. I am genuinely grateful to be playing and truly love every moment I am out there. WPH: In the last Race Stop in Denver, you played one of the most exciting matches in the history of the Race tour. Although you ultimately lost 27-25 in overtime to #1 ranked pro Charles Shanks, what did that mean to you to play at that level on that stage? EP: During our match in Denver, I had match point after a grueling rally. I contemplated calling a time out but decided against it. I knew I was marginally winded but figured Charley had to be slightly more winded than I. I went for an off speed power serve down the left. Due to my fatigue, it didn’t stay down but came around the corner about three inches off the back wall. Charley told me that he knew he was going for it, it was either going to be a kill or a skip. It was neither. Instead, the ball cracked out flat on the sidewall. Charley came in and served out. It was a difficult match to lose, but I am glad that we both played well and pushed each other to play at the top of our game. Charley and I have been rivals since he defeated me at the 2001 USHA Junior Nationals. I am honored to be capable of prolonging the rivalry. Charley is an outstanding player. Not only does Charley have one of the best serves in the game, an exceptional back wall, immense power, and tremendous determination and fortitude, but he is also an exemplary gentleman on and off the court. I have and will continue to learn from Charley’s conduct, handball abilities, dedication, friendship, and character. It has been and will always be a privilege to compete against him. WPH: You have a Master’s degree in philosophy from Boston College. How does your passion for Philosophy help or hinder your handball game? EP: Well, what do you mean by philosophy? Just kidding. But honestly, philosophy is not easily describable or understandable. If pressed to describe philosophy tersely I would sum it up in the word courage. Philosophy can be seen as the continual practice of courageously realizing one does not know or understand what one believes he does. To take an example from Plato’s dialogue Theaetetus. Socrates talks to young Theaetetus about his practice, viz., philosophy. He tells Theaetetus that he, Socrates, is similar to a midwife in that he assists souls in giving birth. He then goes on to say that when souls give birth people tend to hold onto their progeny whether their offspring turns out to be true or merely an image. Socrates even says that most people tend to go wild when he attempts to take their nonsense away by exposing the falsity of their views. The example illuminates the extent to which we tend to think we “know” things. Most of the things we know are things we have heard or read somewhere and over time assimilated them into ourselves, i.e., taken a stand through them and thus defined ourselves by them. However, there is a danger in this. The danger rests in our natural inclination to hold onto our false beliefs as if they were our own offspring. Why? Because they have come to define us—if we lose them, we will lose who we have been up until that moment. This brings me back to my main point: Philosophy is a courageous experience in that it makes one face himself by continually exposing the groundlessness of nearly everything one thinks he is. In other words, it gives one the courage to face devastating loss. Philosophy has not only given me the ability to face my limitations and shortcomings but it has also given me practice in coping with the loss of who I thought I was. For example, when I finally aggravated my shoulder injury to the point at which I had to have surgery, I had to face the loss of who I was and wanted to be. I was not sure if I would ever play again at a top level. If I did not have the experience I had gained from the practice of philosophy I would have most likely given up, instead, I had surgery, had the courage to start from the ground up, coped with and faced my limitations, and I now might be able to play at a higher level than I have ever played before. Philosophy has been necessary to my handball performance. I would not be the player I am today without it. WPH: At 30 years old, you are now one of the veterans on the tour. How does it feel to play guys that look up to you the way you admired John Bike, Naty Alvarado, and Tati Silverya? EP: It is hard to imagine I am admired, especially to be admired the way I admire the players you mention. It is also hard to imagine I am a veteran on the tour. Let’s just agree to disagree. WPH: You have officially qualified for The Player’s Championship after narrowly missing qualifying last year. What does it mean to you to play in the most elite and prestigious field in handball? EP: It is a privilege to have qualified and I will not abuse this privilege. I will train all the way up until the event and I will do every (natural) thing necessary to push myself to play at the top of my game. WPH: You were recently named a WPH Team Member. You will be coaching junior clinics at various high-profile tournaments and camps, including this year’s Canadian Nationals, and serving as a WPH representative and ambassador. How excited are you to help grow the sport of handball and create the type of opportunities that you had as a young man to enjoy this sport? EP: First of all I would like to commend the WPH for the fantastic job they have done thus far in creating a marketable product. The webcasts are strikingly professional, eye-catching, and well done. Contrary to common belief, handball is thoroughly exciting to watch. In fact, there is no sport I would rather watch than handball. Cameras cannot do justice to the difficulty of playing any sport, but the WPH’s film crew and commentators have managed to make accessible the excitement our great game exudes. I now think the WPH is in a highly desirable position in which to market their product. I look forward to play an important role in this process. It is a privilege to be an ambassador to this great game and I enthusiastically thank the WPH for this opportunity. I am planarity excited to help grow the sport of handball and create the types of opportunities that I have had as a player. If I can enable one person to share in the happiness I have gained throughout my time involved with this sport I have every right to feel accomplished.